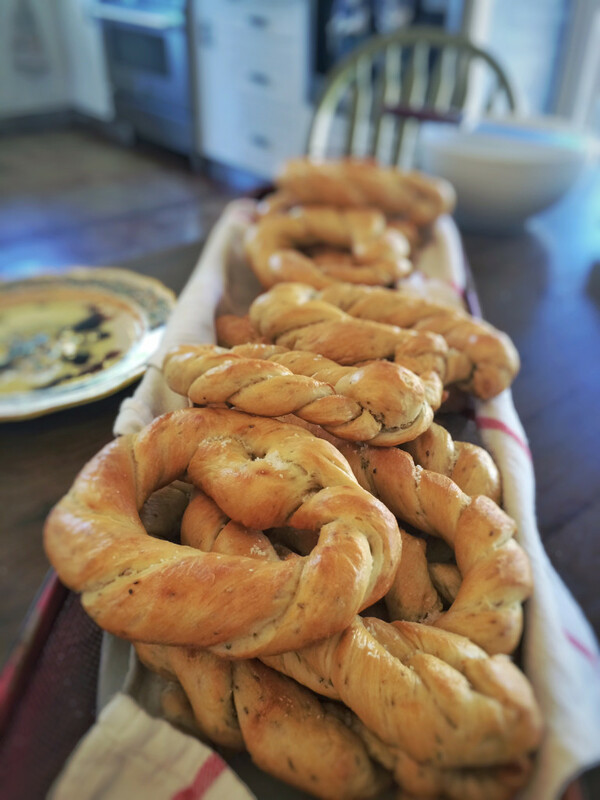 A delicious braided bread that has the consistency of a bagel and a hint of anise flavor— perfect as a snack or with a simple arugula salad for lunch or dinner!  *You may have heard of “Ciambella” and wondering if this is a mistake. My nonna pronounced it distinctly as “Ciamella” [CHA-MEL-LA] without the b— something that in addition to the technique itself has been passed down the generations in my family. 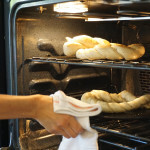 My calling it “Ciamella” is just another way of preserving the family tradition! 4 "nonna scoops" kosher salt the amount of salt that fits a gently cupped hand. Sift flour into an extra large mixing bowl. Mix yeast with approximately ½ cup warm water in a cup. 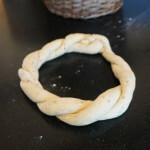 Make a “well” in the middle of the flour and add the salt, eggs, anise, and yeast mixture. 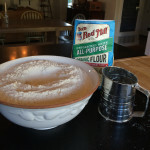 Start mixing in your ingredients from the “well” in the center of the flour. Start the mixing process with the ingredients in the middle, then gradually mix in the flour from the sides and slowly add in the heated (warm) water. 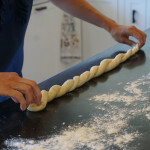 Once everything is mixed together, sprinkle some flour on a wooden board and begin kneading the dough using rolling and punching motions; the dough should be fairly soft. If you need to add any dry bits of dough or water, always add it to the middle of the dough, so that you won’t make the working surface sticky! It’s a good arm workout, too! Place dough back into a clean mixing bowl and bless; then cover and place in the oven to rise for 3 hours or so. 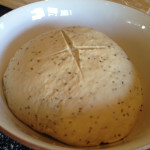 If dough has risen and you are not ready to begin the next step you can place the dough in the refrigerator for a ½ hour. Heat oven to 450-475 degrees (convection/higher heat is better). Coat pie tins with approximately 1 tsp corn oil. 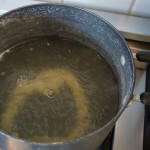 Boil water in large (pasta size) pot. Sprinkle flour onto wooden board, if needed. Cut off a piece of dough. Roll out into a "long snake". Once at about 4 ft long, fold in half and hold the folded edge in place while you twist the loose ends to form a rope or braid. Place ciamella in boiling water; after 30 seconds, cover and cook for approximately 2 minutes. Remove from the water and place on pie tin. Bake in the oven on the tin until you need the pan for another ciamella, then transfer the ciamella to the top oven rack and bake until golden brown. Remove from oven and sprinkle with sea salt before they cool. Want to save them for later? Just store in plastic bags and freeze, then pop them in the oven when you're ready to eat! 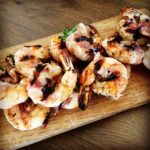 Works great with a simple arugula salad dressed with olive oil, balsamic vinegar, kosher salt and parmigiano reggiano cheese; dip ciamella in the dressing for an extra yummy treat! 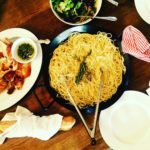 Posted in Fai da te — Recipes & Projects and tagged anice, anise, bagel, Bread, cena, ciambella, dinner, lunch, pane, pranzo, Recipe, ricetta, ricette, savory. Love what you’re doing! Will you be shipping across country? Ciao Sybil 🙂 Thank you for your encouragement! We are not currently set up for that, but it’s definitely a possibility in the future. Thank you for the recipe! I am planning On making them soon. I was wondering about the salt though! Isn’t four nonna scoops as you call it a bit too much? Or did I misunderstand? 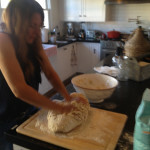 Being Italian I am used to making bread and other recipes by using my hand as a little scoop to measure the salt. 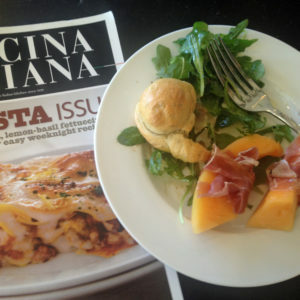 I am so happy that you will be trying out our recipe for Ciamella. My nonna used her hand as the scoop (just like you thought) and with four of her scoops, the ciamella never tasted salty to me; however, you could use slightly less if you are concerned about it being salty. Please keep me posted on how it goes. I hope you will enjoy it as much as we do! 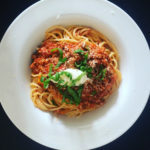 I am from Sora and have been looking for this recepie, doing it today!thank you Nonna! My family and I were from the Lazio area too and we also call them ciamella or ciamelle. Recently went to an Italian deli and for them the ciambella is a cookie. And that’s what they sold me. Ciao Maria, thank you for commenting and for the great review! Buona giornata! We are originally from the Lazio region – Veroli to be precise(though I was born and live in Canada). We also call them ciamelle without the ‘b’. Ciao Maurizio, thank you for taking the time to share this with me. Buona giornata! Grazie, Dino! I appreciate your kind reply! Can anyone give me an approximate amount of salt? Also, what is a package of anise seed? 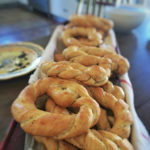 These sound like taralli, but prettier with the braided shape. It is a 1.75 oz jar of anise seed, and I believe it would be around 4 tbsp of kosher salt. My family is from sora as well….and ironically (or actually not) my last name is dicarlo also. My grandmother and her sister made the best ciamella in the world and i truly miss it. Im gonna put the bug in my moms ear to make some as she is the current worlds best living cook as far as im concerned….thx for the article. What a coincidence! Love this… thank you for sharing! Ma grand-mère habite un petit village près de Sora, Santopadre. J’ai mangé des ciamella (sans le b) tous les étés de mon enfance et adolescence. Lire cette recette me fait remonter les odeurs et sensations. J’ai envie de retrousser les manches pour cette recette. Merci d’avoir partagé. Ciao ! Merci pour tes mots gentils! Tu me fais plaisir!